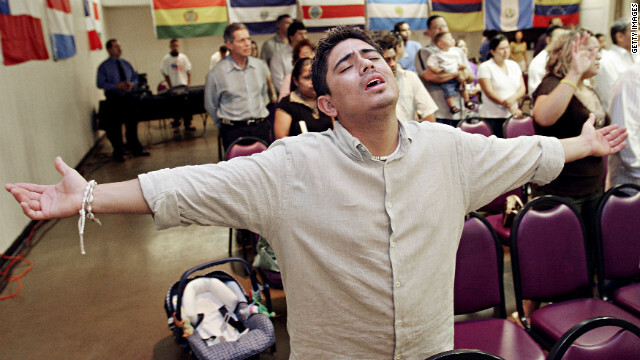 Washington (CNN) – Very religious people rate higher – compared to the moderately religious and nonreligious – on a Gallup “well being” survey released Thursday. According to the survey, very religious people from all religious groups surveyed higher than their nonreligious brethren. Very religious Jews scored highest on the survey with a score of 72.4. Very religious Mormons finished a close second with 71.5. By comparison, moderately and non religious Jews scored in the 68 percentile, while moderately and non religious Mormons scored in the 63 percentile. Gallup defines well being based on a number of emotional and physical health indexes in their Well-Being Index. “The findings confirm that the strong positive relationship between religiosity and wellbeing that Gallup previously demonstrated holds regardless of faith,” stated a release by researchers Frank Newport, Dan Witters and Sangeeta Agrawal. Though the difference from the top was only about 7 points, those who identified as not religious, atheist or agnostic finished at the bottom of the scale with 65.8 points. “The relationship appears to be largely independent of the proportions of very religious, moderately religious, and nonreligious in each religious group, and it is more closely aligned with the faith itself,” the release stated. An example: while Muslims have a lower level of well being than Jews, the gap between the most and least religious constituencies is roughly the same. In comparison, people from other non-Christian religions and Jews were predominantly nonreligious with 43.7 and 53.5 percent respectively identifying as such. The survey was compiled from 676,000 interviews and has an error range of plus or minus less than one percent. These interviews were conducted from January 2010 to December 2011. I can provide a first hand account of the delta in well being between an agnostic and a Born Again Christian. The facts are that this world really is a risky place. As the Jesus says Jn 16:33 "In this world you will have trouble"
Lk 12:4 4“I tell you, my friends, do not be afraid of those who kill the body and after that can do no more. This is one of the elements of Christian Joy. Eph 5:1Be imitators of God, therefore, as dearly loved children 2and live a life of love, just as Christ loved us and gave himself up for us as a fragrant offering and sacrifice to God. It is fun to be a blessing to people, to sacrifice yourself on someone elses behalf. Jesus has taught me this, and it is a Joy. Jn15:9“As the Father has loved me, so have I loved you. Now remain in my love. 10If you obey my commands, you will remain in my love, just as I have obeyed my Father’s commands and remain in his love. 11I have told you this so that my joy may be in you and that your joy may be complete. 12My command is this: Love each other as I have loved you. 13Greater love has no one than this, that he lay down his life for his friends. All in all, the Christian life IS a life of ever increasing Joy on earth, and I haven't even mentioned anything about the afterlife.. Heaven. Happiness and Joy are not the same. Happiness is momentary,, joy is an eternal dispositional state of being. I guess the old adage that ignorance is bliss applies here. What's to fear when you stick your head in the sand and shut don't critical thinking? Happy for them. This survey can be summed up in three words; Ignorance Is Bliss. People who live in fantasy worlds need not concern themselves with the trials of reality. Well, now here's an irony Gary. You're against ignorance. So, presumably, you're for evidence. Yet here you're being presented with evidence. Evidence that suggests your worldview does not lead to people thriving. You don't like that conclusion, so you dismiss the evidence. You'd rather be ignorant. – The survey made an obvious link between interest in a person's health and their religious preference, and some people reported greater "well being" than they currently felt. "Well being" is a fuzzy concept to begin with. For that matter, so is God. For many people, God is a sock puppet. He hates who they hate and likes what they like. Judge not, that ye be not judged? Well, that's OK for my friends but this person I hate is gay. It's OK to hate him because you hate him, right God? Religion can have its good points, but in too many cases it is an excuse to build your own reality at the expense of the real world. It is used to justify violence, bigotry, and a deep distrust of science. We're better off without it, and the invisible man everyone argues over but never sees. It's because atheists are likely miserable. Well, it's easy to be miserable when you see things for how they really are and not just how you want them to be. Reality isn't just the mythology you choose to believe. Im sorry Tom Tom the pipers son? Can't believe with a name like Tom Tom the pipers "son" I would mistake you for a guy. Surely im not the only one eh? Though his pe.cker is just the size of a pri.ckle, but I'm certain it was pri.ck just as he always be. I knew it, he was my pri.ckin son. I personally dont believe that there is a man like figure sitting up in the sky watching your every move. He isn’t there making sure your sports team wins. He isn’t there talking to the pope, the rabbi’s, or any other religious leader. And he certainly isn’t there talking to any of you. sorry to say but, we're just not that important. He does have laws though, that must be abided by. For instance there are things you must do to live, and procreate (even though his laws have allowed us to do that outside of our own bodies), we must stay clear of certain elements while devouring and enjoying other elements. His laws are made of laws you may have heard before. Like laws of gravity, laws of physics, and velocity, and logic. For god is completely undeniable! God is the universe and more. So, would you just be a standard Deist then? The watch or clock maker philosophy? Yes! And I really appreciate you're insight on the subject, and feel the need to thank you for not labeling me an atheist. Our destinations will be laid out in time with science and true understanding of these (gods) laws. Be patient we”LL get there in time! until then we need to love, respect, protect, and feed one another so that we survive long enough to achieve the goal of god. One more thing. This gods laws, are proven everytime scientist have a new break through, or discovery. another one of gods fascinating laws are revealed. Its important that we understand it, question it, and finally correct what we can, and accept what we can't. His laws are unforgivable. He's not an angry god. Just one that has given us life, in a place where his laws can't by any means be broken, you have no choice in them, for they are already set. You can't break them if you wanted to. For god has made sure of this! Love god, your fellow man, the planet, the universe. And constantly remind yourself how small you are in gods creation. For this is your true god! For your bible was hand written by man to impart laws for civility. And these laws are 2000 years old now. Its time to believe in what we know, and let go of what isn't real! I am often called an atheist in here, by bible followers for not believing in the bible.. But im not sure I can be classified an atheist, since I do believe in our god. The bible was written by men for men. The laws of the bible can be broken at anytime. But The law of our true god, cannot be broken by any means! Do you want to see God? Look up into a clear night sky and bathe yourself in the wonder of the universe. Organized religion is a scam. God is earth, earth is God. So right! The earth is apart of god! A much bigger part of god than we are! Interesting in saying that Organized religion is a scam. The church was one of the first places that the African American community were allowed to meet and organize. Churches such as Martin Luther King's Ebenezer Baptist, was one of many churches that the final push for equal rights originated from. Mosque Number 7 for Malcolm X is another. I will not say that there are no churches that are shams or fronts, but there are churches, mosques and Synagogues that do good works in society and is it fair to lump them in with those that do bad?